If you satisfy all of the above reasons, make sure you apply for an OD rather than a personal loan. Later, I'll post the current rates and OD facility by the main banks in Malaysia. 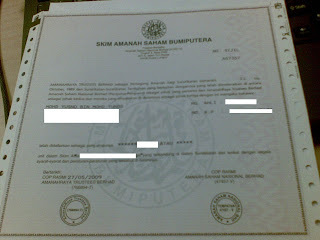 For those who do not know what an ASB cert is, the above is a sample of a cert converted from an ASB Book. You can convert any amount of your ASB savings to a cert at the PNB offices/branches. Only then you can use it as collateral when applying for OD. I needed quite a sum of money to start a new business. It was down to the banks to lend me the money. The obvious choice was to apply for a personal loan. After doing some research, it seemed like the best package and rate offered was provided by Bank Rakyat (5-6.5% based on tenure). It was surprising to see most of the commercial banks in Malaysia have high interest rates for personal loans (between 8-12%)...and we wonder how on earth do the banks make a lot of money. The only problem with getting a personal loan with Bank Rakyat, is that my company has to be in the list of panels with the bank. My company, however, is not a panel. The panel registration with Bank Rakyat would take at least a month for approval. That was when I decided to fall back on my last option, the one which I've learned a year ago from financial blogs and web sites but haven't really mastered or put it to use effectively. I'll write about how I used OD or Overdraft Facility to start my new business in my future post.